Birding Is Fun! : Being wrong never felt so good! Earlier I posted these photos thinking I was sharing pictures of a Cassin's Vireo. I even dared to suggest some ID tips as to why it was a Cassin's Vireo. While in Arizona last week I took these photos and thought in the field that it was a Cassin's. Admittedly, I lack regular experience with vireos other than Warbling Vireos. I didn't have any field guides with me, so I compared my photos to those at AllAboutBirds.org as well as the identification tips contained therein. The big amateurish mistake I made is keying in on the yellowish flanks and ignoring everything else. So now, based on the fine commentators, a couple bird expert friends of mine, and additional study in my field guides, I can now tell you why this is a Plumbeous Vireo and not a Cassin's Vireo. 1. 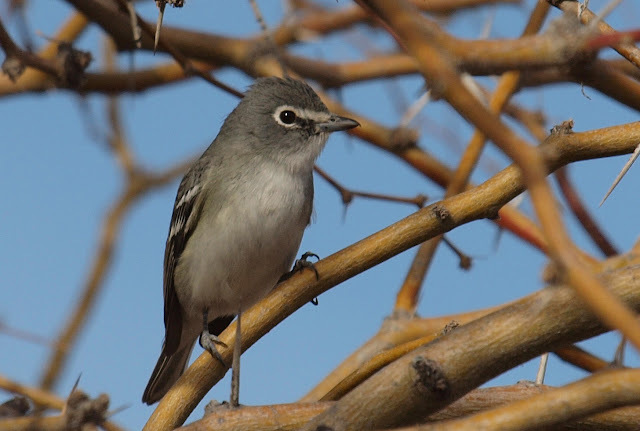 This bird is mostly grayish whereas a Cassin's Vireo significantly more olive and yellow. 2. The bill on this Plumbeous is larger and more stout than a Cassin's. 3. The edges of the secondaries are gray. A Cassin's will have greenish edges. So, though I am a little embarrassed by my public error, I welcome the privilege of learning from my identification mistakes. 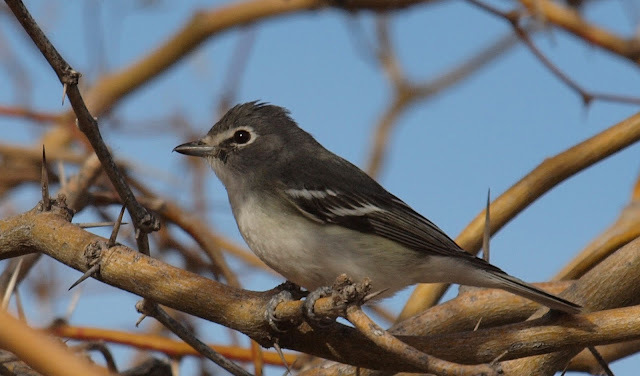 The reason being wrong never felt so good is that Plumbeous Vireo is a new life bird!!! A little correction on my eBird checklist and bam!...Life bird #373! Congrats on the lifer and thanks for the education on this bird. very nice! and congrats too :) Lifers are always fun! @Steve Creek @Chris @Johnny Nutcase - Thanks for the nice comments! Well, it is comforting to know that I am not the only one to make mistakes! What a great bird to get! Congrats on the lifer! Awesome photos by the way! And, your mistakes helped all of us learn something new!